It’s been a while since the Nieman foundation released its report on mastering the art of disruptive innovation in journalism. But it’s still intensely relevant today, largely because it offers an explanation (without meaning to) for the trouble news organizations are having with sponsored content and non-display advertising. Instead, a better way of thinking about the business you’re in is through the lens of a theory that we call jobs-to-be-done. The basic idea is that people don’t go around looking for products to buy. Instead, they take life as it comes and when they encounter a problem, they look for a solution — and at that point, they’ll hire a product or service. The most successful and disruptive companies, the report continues, find out which needs (which jobs, that is) are going unfilled and create products that fill them. Advertising should fill jobs in people’s lives, too. Right now it’s not. Display advertising, long the main source of revenue for newspapers and other editorial products, isn’t working. And it’s even worse on mobile, where more and more users are turning for their news. 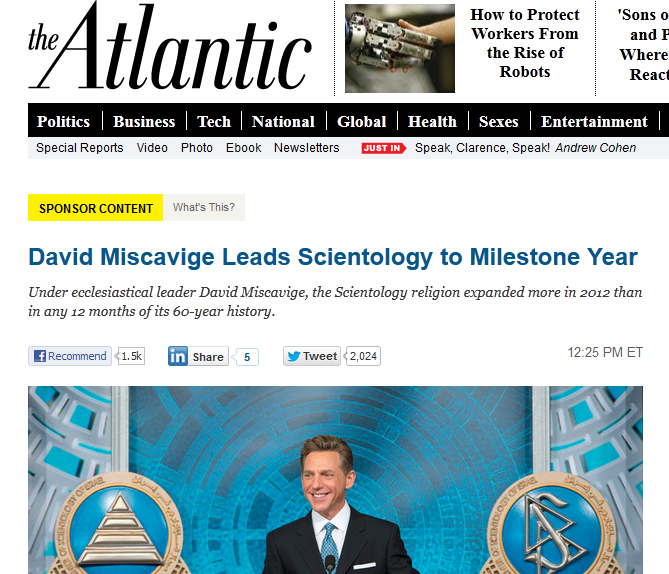 That’s the climate in which The Atlantic published paid “Sponsor Content” from the Church of Scientology. It was an attempt, as is all native content, to produce advertising readers don’t ignore. People brought up plenty of legitimate issues with the Scientology piece. It was tone-deaf, especially in the context of questions being raised about Scientology by other news organizations. There were also ethical issues with the comments on the piece, which were suspiciously positive. The larger response, though, was that the content just felt wrong. And I think that’s tied directly to the concept of jobs-to-be-filled. Who did the Scientology piece fill a job for? Not The Atlantic’s readers, who were the wrong demographic entirely and who didn’t feel served by the schmaltzy, over-the-top nature of the piece. And not the Church of Scientology (because that matters too), who likely didn’t reach a significant amount of readers before the piece was yanked. Several people who wrote about the Atlantic snafu turned to BuzzFeed founder/CEO Jonah Peretti for insight. BuzzFeed has eschewed display ads entirely, in favor of native content — which is produced by a separate, in-house creative team. But the native ads on BuzzFeed, compared with The Atlantic’s Sponsor Content, inhabit a completely different end of the spectrum. Advertisers are encouraged to do a soft sell, instead of talking directly about themselves and their products. This leads to content like 24 Hours in New York City with a Cat, sponsored by Samsung, and Serial Killer or Cereal Inventor? sponsored by BBC America. Out of everyone, BuzzFeed’s creative team is closest to producing web advertising that works. The site’s sponsored content is obviously filling jobs (bored in the coffee line, need a midday pick-me-up) for readers of the site, who often rank and rate and comment on the content just like they would if it was produced by the editorial team. My hesitation, though, is about the value being provided to the advertiser. Obviously, only the advertisers themselves know what return they’re getting on their investment. But it seems to me that BuzzFeed’s sponsored content is so tenuously connected with the sponsors themselves that it may not serve its purpose for the purchaser. Peretti has alluded several times to a coming renewal in the “Mad Men” era of advertising. Every time he does, I think about the infamous ’07 episode “The Wheel,” when Don Draper lyrically pitches the Kodak carousel. Nostalgia — it’s delicate, but potent. Teddy told me that in Greek, ‘nostalgia’ literally means ‘the pain from an old wound.’ It’s a twinge in your heart far more powerful than memory alone. This device isn’t a spaceship, it’s a time machine. It goes backwards, and forwards…It takes us to a place where we ache to go again. It’s not called the Wheel, it’s called the Carousel. It lets us travel the way a child travels — around and around, and back home again, to a place where we know we are loved. Yes, it’s from an AMC show; it’s not a real ad. But the words above fill two jobs in my life (or would if I didn’t live in the age of iPhones and Instagram): I’m compelled by the words themselves, but the language and nature of the advertisement. And I’m compelled to buy a Kodak Carousel. “24 Hours in New York City with a Cat” compels me to laugh. But it doesn’t compel me to buy a Samsung Galaxy camera. Digital advertising is broken. It needs to be fixed. But the straightforward advertorials of the past are not going to work, either. Ads need to perform jobs for readers and advertisers alike, or they’ll become just as ineffective as the display model. an ideal means of writing? I’ve a presentation next week, and I am at the search for such information.